Previously I have written about the metric which can help us quantify and assess the strength that a team used to press the opposition; Passes per Defensive Action or PPDA. In a follow up article which looked at manager tendencies in relation to this PPDA metric it was no surprise to find that Marcelo Bielsa ranked very highly amongst managers that incorporated a pressing game. In fact, over the last four seasons across the Big 5 leagues only six managers used a more agressive level of pressing that Bielsa did. Bielsa took over the reins at Marseille at the start of this new season and he and his team have made a great start to the season. With five wins and a draw from their opening seven Ligue 1 games Marseille currently lead the league. It’s also fair to say that the gusto that his team presses with has gained some media attention. An example of which found its way into my Twitter timeline last night. It’s very early in the season but I wanted to see how Bielsa’s Marseille have performed on my PPDA metric; ie just how strong has their press actually been. We are all aware that different leagues have differing preferred playing styles, and this is especially true in respect of pressing. In previous articles I showed that the level of pressing is lower in France and England than it is in the other 3 of the “Big 5 leagues”. To ensure we are comparing like with like, I looked at PPDA values for all individual games played over the previous four seasons within each of the Big 5 leagues. Below are the PPDA values at various percentiles for French Ligue 1. As an example, in Ligue 1 a team that recorded a PPDA value of 6.85 in a game would mean that their “pressing performance” was in the top 10% of aggressive presses in the context of that league. But remember, this table is based on single, individual games and not on a cumulative number of games. So what do Marseille’s PPDA values look like on a game by game basis this season? We can see that the data, unsurprisingly, backs up and confirms what our eyes have been telling us; Marseille have been operating a very agressive press. Indeed their cumulative PPDA over the course of the opening seven games of 8.66 is the lowest in Ligue 1, in other words Marseille are pressing more aggressively than any other team in the league. If anyone is interested this is the “Pressing Table” for all teams so far in Ligue 1 this season. I’m sure that someone much more familar with French football than I am can tell me if these rankings are in line with the public perception of how individual teams set themselves up. Some interesting patterns emerge when we look at Marseille’s pressing on a game by game basis. The first two games they played seen them record their most aggressive press, and the intensity of the press has tapered off since then. 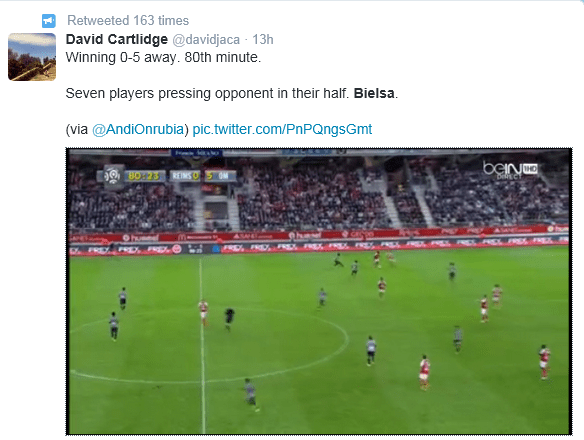 Is this a case of Bielsa toning down his press because it didn’t suit his players? I don’t think so. Marseille didn’t win either of their first two league games this season, and we would expect teams that are chasing the game to use the press more as they attempt to regain possession and thus record higher PPDA values. Despite what the twitter screenshot (that I posted above) shows, there is no doubt that teams will not press quite so aggressively when they are leading. Why would they risk getting played through? The apparent decrease in Marseille’s pressing aggression as the season has progressed can be explained, however it is worth pointing that none of the games have seen OM record a PPDA value ranked in the 90th percentile or higher (with reference to individual game Ligue 1 PPDA values). Then again, when teams are winning it would probably be unwise for them to press so aggressively that they notch up a pressing score in an individual game that places them in the top 10% of all values recorded in France. During Bielsa’s time in control of Bilbao his PPDA value was 8.39. From a pressing point of view it is arguable that Marseille’s PPDA of 8.66 in the context of Ligue 1 is even more impressive than the value he recorded in Spain. There is no doubt, Marseille are playing football according to the Gospel of Marcelo Bielsa. It will be super interesting to see if this brand of football will be good enough to win the title and see off the might of PSG.